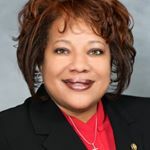 Erica D. Smith is the second declared Democratic candidate for the Thom Tillis seat in the US Senate. Trevor Fuller was first. Erica Smith was first elected to the NC Senate in 2014 from the sprawling 3rd District -- now including Beaufort, Martin, Bertie, Northampton, Warren, and Vance counties. She earned her B.S. in mechanical engineering from North Carolina A & T University in 1994 and her M.A. in religious studies from Howard University School of Divinity in 2000. She worked for Boeing as a senior specialist engineer from 1993 to 1997, for the U.S. Patent & Trademark Office as a patent examiner from 1998 to 2003, and as a high school math, physics, and chemistry teacher. Back last August, Colin Campbell gave Smith a shout-out in the News and Observer as one of a group of highly talented minority legislators in Raleigh who look ready for bigger things: "An engineer, educator and ordained minister, Smith chairs the Legislative Black Caucus and has been effective in helping the state’s economically challenged northeastern corner. She recently fought for a summer science, math and technology program that was targeted for budget cuts, and it’s now expanding into more counties." She announced her candidacy yesterday on Twitter. Neither Fuller nor Smith are much known outside their bailiwicks, and they look like long shots. However, lightning's been known to strike even at lower elevations.